For the best part of twenty years until she died, Mary Stuart was either imprisoned or on trial in England at the behest of her first cousin, Elizabeth I. 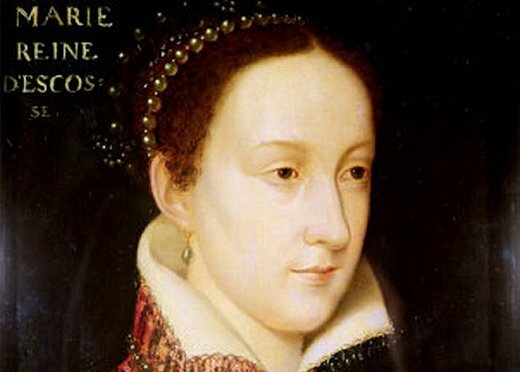 Her entire life was anything but normal, having been crowned Queen of Scots at nine months of age, married and widowed by the time she was seventeen, and even Queen of France for a short period. She also had her eye on the English throne, and that cemented her downfall. 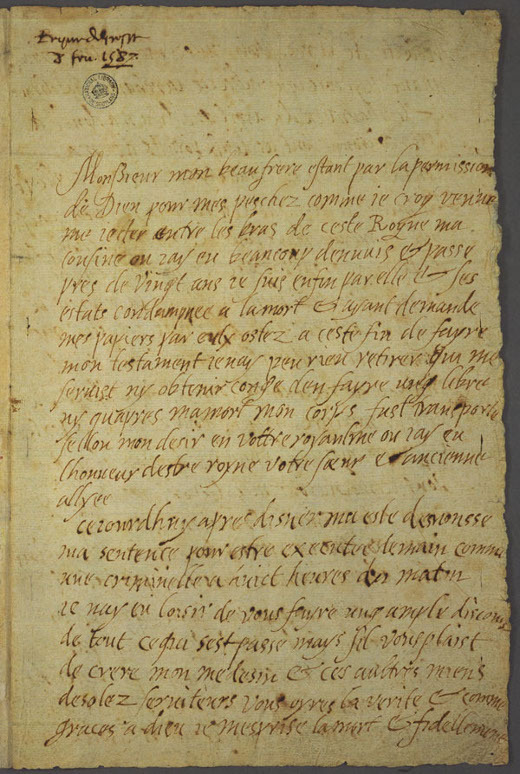 The following farewell letter was written by Mary, then aged 44, in the early hours of February 8th, 1587, to the brother of her deceased first husband. 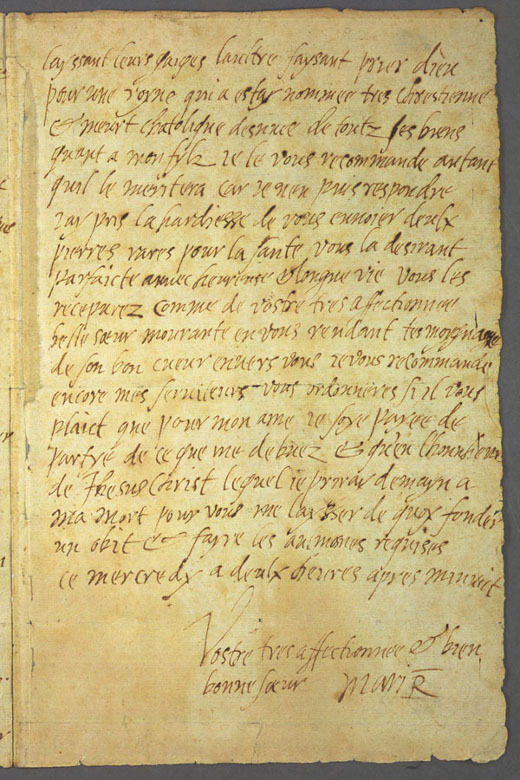 Just six hours later, as mentioned in the correspondence, she was beheaded in front of 300 witnesses. Royal brother, having by God's will, for my sins I think, thrown myself into the power of the Queen my cousin, at whose hands I have suffered much for almost twenty years, I have finally been condemned to death by her and her Estates. I have asked for my papers, which they have taken away, in order that I might make my will, but I have been unable to recover anything of use to me, or even get leave either to make my will freely or to have my body conveyed after my death, as I would wish, to your kingdom where I had the honour to be queen, your sister and old ally. Tonight, after dinner, I have been advised of my sentence: I am to be executed like a criminal at eight in the morning. 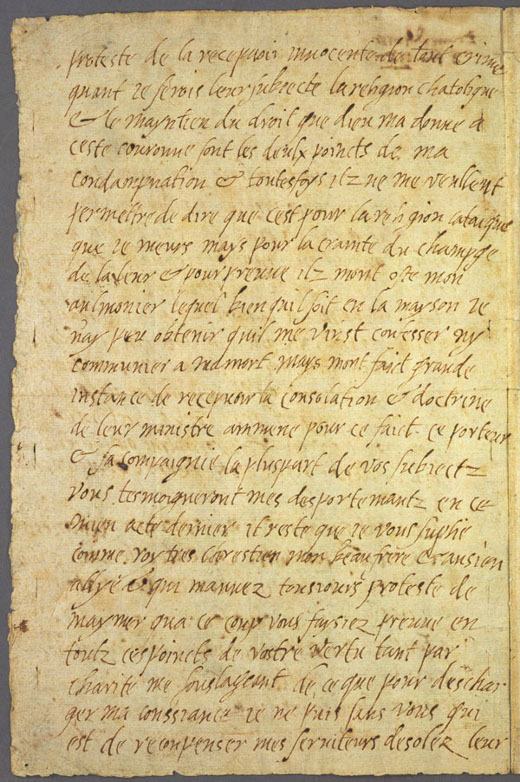 I have not had time to give you a full account of everything that has happened, but if you will listen to my doctor and my other unfortunate servants, you will learn the truth, and how, thanks be to God, I scorn death and vow that I meet it innocent of any crime, even if I were their subject. The Catholic faith and the assertion of my God-given right to the English crown are the two issues on which I am condemned, and yet I am not allowed to say that it is for the Catholic religion that I die, but for fear of interference with theirs. The proof of this is that they have taken away my chaplain, and although he is in the building, I have not been able to get permission for him to come and hear my confession and give me the Last Sacrament, while they have been most insistent that I receive the consolation and instruction of their minister, brought here for that purpose. The bearer of this letter and his companions, most of them your subjects, will testify to my conduct at my last hour. It remains for me to beg Your Most Christian Majesty, my brother-in-law and old ally, who have always protested your love for me, to give proof now of your goodness on all these points: firstly by charity, in paying my unfortunate servants the wages due them - this is a burden on my conscience that only you can relieve: further, by having prayers offered to God for a queen who has borne the title Most Christian, and who dies a Catholic, stripped of all her possessions. As for my son, I commend him to you in so far as he deserves, for I cannot answer for him. I have taken the liberty of sending you two precious stones, talismans against illness, trusting that you will enjoy good health and a long and happy life. Accept them from your loving sister-in-law, who, as she dies, bears witness of her warm feeling for you. Again I commend my servants to you. Give instructions, if it please you, that for my soul's sake part of what you owe me should be paid, and that for the sake of Jesus Christ, to whom I shall pray for you tomorrow as I die, I be left enough to found a memorial mass and give the customary alms.